A superior color enhancing, supplemental diet for hobbyists who want their koi looking their best. * An outstanding, natural color enhancing diet offering a superior blend of pure-cultured Spirulina and added carotenoids. If you're looking for the most vibrant colors your koi can muster without affecting the white areas of their body, this should be your first choice. * The manufacturing technique used to produce Hikari Spirulina has been developed from over 110 years of koi breeding, keeping and showing experience. 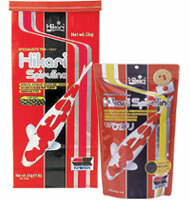 If you're looking for championship koi, make Hikari Spirulina part of their regular feeding regiment. All koi where noticeable improvement in coloration is desired.